This plan depicts a proposed upgrade for Gorham High School, where enrollment is expected to hit 1,027 by 2028, up from 868 now. GORHAM — The Town Council and Town Manager Ephrem Paraschak in a joint workshop with the School Committee and school staff Tuesday heard details about the proposed expansion/renovation of the town’s aging and overcrowded high school. Plans include a new, two-story classroom wing, a relocated main entrance to improve security, an expanded cafeteria, athletic facility improvements and increased parking. The expansion would eliminate the existing Access Road between the high school and Robie Park and shift school bus and other traffic to Ball Park Road from Morrill Avenue. School officials hope for a local referendum on Nov. 5 this year to approve a project. A cost of the proposed project remained unknown this week. “We’re working on a cost estimate,” Cecil said. State aid for the project is unlikely and the cost will fall to taxpayers. The public will have an opportunity to learn about the project at a forum at 6 p.m. Monday, Feb. 4, at the high school, 41 Morrill Ave. The high school opened in 1959 and was renovated in 1994 to accommodate 750 students. Enrollment, according to School Department figures, peaked at 890 in 2006 and is now 868. It is projected to jump to 969 students in 2027 and 1,027 in 2028. Superintendent Heather Perry said issues include overcrowding, shortage of classrooms and parking, inefficient mechanical systems and an undersized cafeteria. Some students sit on the floor during lunch, she said. Under the proposed plan, the number of regular classrooms would be increased from 33 to 41 and science labs would go from eight to 10. Library square footage would be increased. A cafeteria would be designed to accommodate 1,100 students and a lecture hall would hold 125 students. A second gym would be added and both would feature competition sized-courts. Parking would be increased from 278 spaces to 473, including diagonal parking along a widened Ball Park Road. Athletic field improvements call for synthetic surfaces for the track, football/soccer field and baseball/field hockey field. A practice field would be upgraded and fields would have modern lighting with aluminum poles replacing wooden ones. Bleacher seating would be increased along with a new press box at the competition field. Five tennis courts and two basketball courts would be built outdoors in Robie Park. The center of Robie Park would remain as it is now. 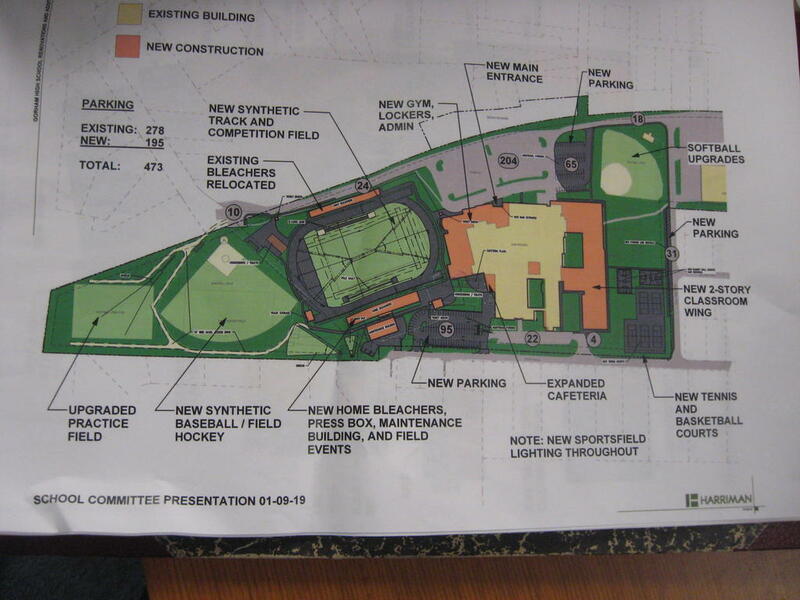 An athletic committee is fundraising to supplement the project’s budget. If approved by Gorham voters, the project could go out to bid in 2020 with a construction start by that summer or fall. Robert Lowell can be reached at 780-9089 or email rlowell@keepmecurrent.com.